@NBAonTNT / TwitterCharles Barkley had a long-bubbling feud with Draymond Green, but the two settled the matter with grace after the Golden State Warriors took home the NBA Championship for the second straight year. 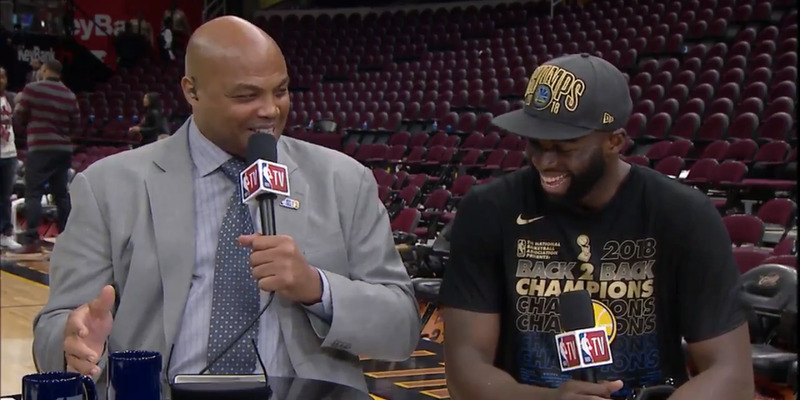 Charles Barkley and Draymond Green got past their differences late Friday night, coming together after the Golden State Warriors secured their second straight NBA title. Barkley had previously called out Green as “annoying,” starting a semi-feud with the Warriors forward that would last throughout the postseason. After the game, Barkley and Green settled their score, with Green ultimately admitting that he probably was annoying, but adding that it was part of his role with the championship team. Charles Barkley finally got to confront Draymond Green and settle the score. “I just want somebody to punch [Green] in the face,”Barkley said earlier in the postseason, in response to Green’s on-court feud with New Orleans Pelicans guard Rajon Rondo. Barkley would go on to apologise for his comments, and would even joke with Warriors teammate Kevin Durant about the dispute later in the postseason, an encounter that ended with Durant inviting Barkley down to the locker room to settle the matter man-to-man. But on Friday night, with the Warriors once again NBA champions, Barkley and Green met in high spirits. “Honestly? I may be!” Green responded. You can watch the full exchange below. Chuck really asked Draymond if he was just as annoying in person as he was on TV ???? And with that, the most contentious feud in the NBA was settled.